In a recent blog, I noted that this year marks the 35th year of my birth. 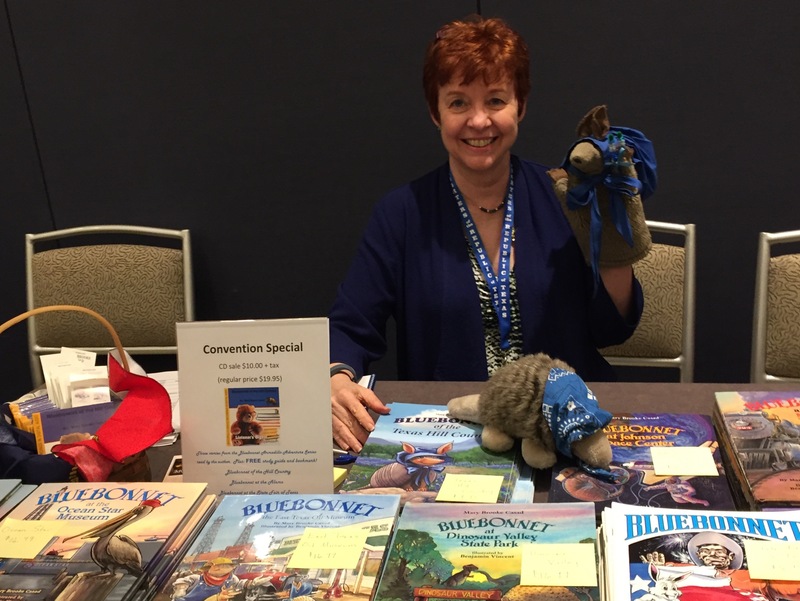 As part of the celebration, I’m telling the “story behind the story” for each of the Bluebonnet Armadillo Adventure series books. Back in the mid-90s, when MBC decided to write about the Texas State Capitol, she had friends in Austin that helped connect her with Capitol officials, who graciously gave us a tour of the Capitol and supplied us with historical information. But the story was greatly influenced by a school visit to then Oak Creek Elementary School in Houston (the name was changed in 2005 to Reynolds Elementary School, honoring long-time principal Pat Reynolds). We were invited to visit this school because we have something in common: their mascot is the armadillo! 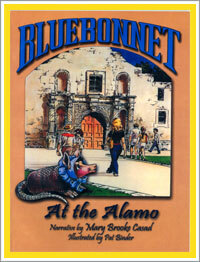 The students worked hard to have the armadillo proclaimed the recognized mascot of Texas in 1981. Because of their efforts, other schoolchildren across Texas lobbied the state legislature for years to adopt the armadillo as the small state mammal and the longhorn as the large state mammal. This was the primary influence for MBC’s story….and that’s why you see Bevo, the longhorn mascot of the University of Texas, make an appearance in this book. Would that we could live up to those words today! 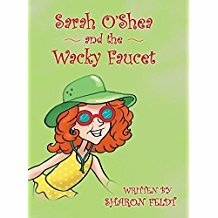 So, they were especially excited to read the second book in the series about Sarah’s trip to the beach. Sarah, known for her wild, unruly red hair (MBC can relate!) takes off on a family trip to the beach, along with her faithful dog, Claude. She enjoys her time on the beach, but when some of the sea creatures make a surprise visit, she learns that the beach is not only her playground, but a home. This inspires her to take action in protecting the beach environment. Last week, MBC and I experienced a “first:” we attended our first convention of the Daughters of the Republic of Texas. It was the 126th time the “daughters” had gathered, however. The DRT was founded in 1891. The Daughters of the Republic of Texas are women who trace their ancestry to those who lived in Texas from 1836-1846 when Texas was its own nation. MBC, whose maiden name is Oliphint, traces her lineage through her great-great grandfather, Wilford Oliphint, who lived in Sabine County with his family. The Gaines-Oliphint cabin still stands there today, purchased by Martha Oliphint, MBC’s great-great grandmother, from the Gaines family. Now MBC may be a native of Louisiana (of which she is very proud), but she is definitely a genetic Texan! Twelve years ago, MBC’s friend, Mrs. Elizabeth Walsh, encouraged her to join the DRT and invited her to become a member of her DRT chapter, James Butler Bonham. MBC has attended chapter meetings throughout the years, but attending this year’s state convention was a first. 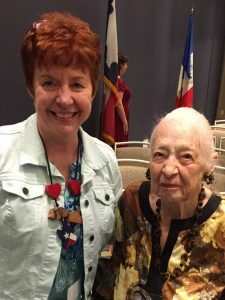 Imagine her delight when Mrs. Walsh, now 103 years old, opened the convention by playing “Texas Our Texas” on the piano. Fortunately for me, MBC took me along so we could sign books…..you know, those books about Texas history she writes…..with me as the main character! We both had a great time meeting so many people who are as interested in Texas history as we are. The Daughters of the Republic of Texas work to preserve Texas history in myriad ways. One that was especially meaningful to MBC and me was the recognition of 4th and 7th grade students for essays on Texas history and the recognition of Texas history teachers. We were pleased to attend the dinner awarding the 2017 winners. Congratulations! There’s much more we could tell you about this convention, but I think this first one definitely won’t be our last. We had a marvelous time and grew in our appreciation of the history of this organization that carries the spirit of Texas from past to present to future. MBC and I will continue to do our part to teach children about Texas and its unique history! MBC recently had some surprising news for me; she reminded me that this year is my 35th birthday! That’s right, it’s been 35 years since I popped into MBC’s imagination. 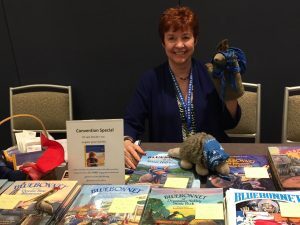 MBC often tells the story of how, in the spring of 1982, her mother-in-law, Dede Weldon Casad, suggested that she should create an armadillo character for children and write a series of books, using the armadillo to visit Texas sites and teach about Texas history and geography. A few weeks later, MBC came face to face with an armadillo on the shores of Lake Bridgeport. 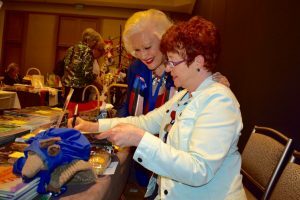 That encounter convinced her it was a sign……time to write about armadillos! She visited the Grand Prairie Public Library and researched armadillos, aided by librarian Joan Dobson, and enlisted the help of two friends who were public school teachers, Ben and Juddi Gilmore. She completed the manuscript of Bluebonnet of the Hill Country on her birthday, September 15…..so that date became my birthday, too! 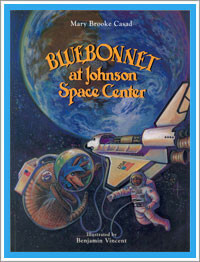 To celebrate the 35th anniversary of the beginning of the Bluebonnet Armadillo Adventure Series, MBC and I will be taking several strolls down memory lane, and sharing these with you. We’ll be posting “the story behind the story” about each of the books. We invite you to come along and share these special memories with us. To kick-off our celebration, we have a special offer on this website. 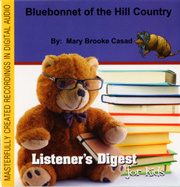 The CD of MBC reading the first three original stories in the series, Bluebonnet of the Hill Country, Bluebonnet at the Alamo, and Bluebonnet at the State Fair of Texas, is offered at a reduced price, and includes a free study guide and bookmark. 90 years of camping in the Texas Hill Country! Ora Johnson, the first woman principal of a major co-educational high school in Texas, had a dream of establishing a summer camp for girls on the banks of the Guadalupe River near Hunt, Texas. Named for a Scandinavian word, Waldemar, meaning “Sea of Woods,” the camp opened in the summer of 1926. Since that time, thousands of girls have attended, creating life-long memories and friendships. From Ora Johnson, to her niece Doris Johnson, to Marsha and Meg Elmore, the camp’s owners and directors, Camp Waldemar has established traditions and legacies that are now a part of fourth-generation camping families. MBC’s family first connected with Camp Waldemar in the 1940s. Her grandmother, Mary G. Kelley, recruited campers from her home in Alexandria, Louisiana, chaperoned campers from La. to camp, was a counselor to the youngest campers and taught bridge for more than 30 summers. Her mother, Nancy Kelley Oliphint, attended as a camper in the 1940s and was also a counselor. Several other family members, cousins and nieces, also attended. The book covers the first 70 years of Waldemar’s history; 20 years worth of tales have yet to be told. And new memories are being made every day! MBC and I celebrate summertime and camping. We give thanks for our family’s long association with Camp Waldemar. Here’s to 90 more years of camping in the Texas Hill Country! 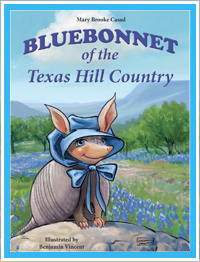 MBC and I are pleased to announce the publication of the latest book in the Bluebonnet Armadillo Adventure Series, Bluebonnet of the Texas Hill Country, published by Eakin Press, Fort Worth, Texas. However, this “new” book is actually a revision of an “old” book, the first in the series. Bluebonnet of the Hill Country was published 33 years ago this month by Eakin Press, which was at that time located in Austin. Several years ago, this book went out-of-print. But this story is foundational to who I am and where I’m from. It’s always the first story MBC tells when she speaks at schools and libraries. We had many requests for this book, and missed having it available. So MBC took the original story, made a few tweaks here and there, and even changed the title. Benjamin Vincent worked his magic with the illustrations, capturing the beauty of my native Texas hill country, and behold: everything old is new again! This story introduces my beloved parents, Mommadillo and Daddidillo, and my sisters Normadillo, Irmadillo and Arvilladillo. It includes several facts about armadillos (did you know we can walk on the bottom of the riverbed?!) 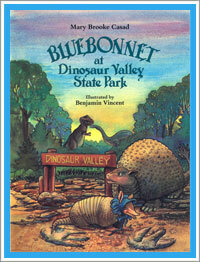 Readers will learn how I got my trademark blue sunbonnet, and of my desire to become a camper. Of course, that’s when the fun and unexpected adventures begin! We are grateful that Eakin Press, now located in Fort Worth, published this book just in time to coincide with a very special event, the 90th anniversary of Camp Waldemar in Hunt, Texas. MBC was first introduced to armadillos at Camp Waldemar, and several of the scenes in this book come from her childhood memories. Congratulations to Camp Waldemar for providing quality camping experiences and a lifetime of cherished memories to thousands of girls over the span of 90 years! 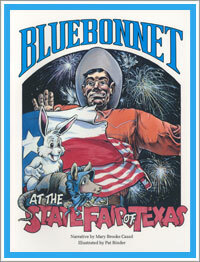 It’s springtime, and here in Texas, that means the bluebonnets are in bloom! I’m proud to bear the name of the Texas state flower, and also wear my trademark blue sunbonnet, which helps shade my eyes on these sunny spring days. I guess it was all those rainy days, however, that helped us have such a bountiful, bluebonnet spring. Everywhere MBC and I go, we are finding lots of bluebonnet flowers……as well as quite a few Indian paintbrush and other beautiful wild flowers. We’re proud of our forefathers, who fought at the Alamo. But you’re still in beautiful Texas, the most beautiful land that I know. This song was written by Wilbert Lee “Pappy” O’Daniel, who served as both governor of Texas and a U.S. Senator. Here’s a link to the song, sung like no one else can sing it……Willie Nelson! May all your days be filled with bluebonnets! 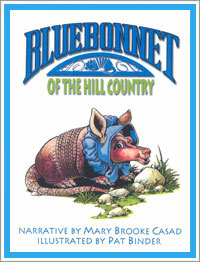 Mary Brooke Casad, author of the celebrated “Bluebonnet the Armadillo” children’s books, will make her first appearance as a Young Audiences of Northeast Texas teaching artist in early March. 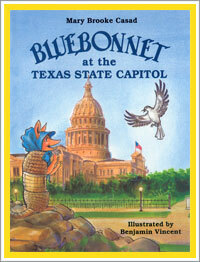 Casad’s program, “The Adventures of Bluebonnet the Armadillo,” features the journey of the title character as she travels throughout Texas and visits the state’s most important historical landmarks. From the East Texas Oil Museum to the Johnson Space Center, Bluebonnet comes from page to stage in the form of a delightfully sweet and shy puppet, who, along with Casad, shares the importance of history with her audience. Casad’s program also highlights the importance of reading comprehension, storytelling, and appreciation of the writing process. Casad joins a roster of over 30 teaching artists who perform for schools and organizations across the Northeast Texas region. Since 1997, Young Audiences of Northeast Texas has been using the arts to enrich the lives of students and enhance their education. In addition to performances, Young Audiences’ also provides arts integrated workshops and residencies to enhance learning across the curriculum, as well as professional learning opportunities for area teachers. What’s that, you say? YOU haven’t met ZOE? This is a special empowerment movement that began in Africa to help orphans learn how to take care of themselves. Through education, through community-building, through providing basic tools, through sharing God’s love, ZOE helps orphans become self-reliant in three years. Approximately 28,000 children are participating in ZOE programs in Guatemala, India, Liberia,Kenya, Rwanda, Malawi and Zimbabwe. The new book, written by Melissa Harrell, was inspired by her 2012 Trip of Hope with ZOE to Kenya. Melissa tells the tale of two young girls: Elizabeth from America, and Stella from Kenya. The story shows that their lives are very different, but connected through the ZOE ministry. Both Elizabeth and Stella discover they are able to make a difference through participating in the ZOE empowerment movement. 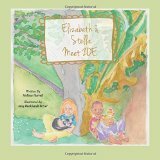 Amy Burkhardt Fetzer illustrated the book with lovely watercolor illustrations. Young readers are sure to be inspired by this tale of generosity in action. MBC and I like books that connect children across the globe and encourage and inspire them into action, especially in action that makes a positive difference in the lives of others. We heartily recommend this book for our young reader friends!